So I've already talked about my love for oatmeal before. I think one of the things I like most about it is that you can turn those tasteless oats into pretty much anything you want. For the past month or so I've been using Instant Oats and trying out different combinations. This one is definitely my favorite. My Uncle recommended making oatmeal with apple juice (instead of milk or water) to get an apple-y flavor and so you don't have to add any sweetener. 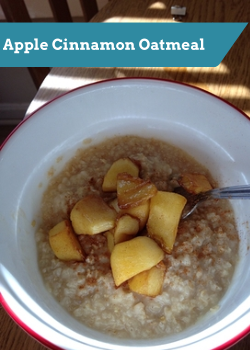 I took that idea and cooked down some apples, added some fixings and created this delicious and easy morning dish. Let me know what you think! Serves 2. Use a peeler to take off the skin of the apple. Dice the apple into equal sized pieces. In the picture above I cut bigger pieces, but smaller ones are great too and cook down faster. Heat up a small skillet over medium heat. Add enough apple juice to cover the bottom of the pan (about 1/4 c depending on the size). Add brown sugar to apple juice and stir until it dissolves. After the brown sugar dissolves, add the apples. Sprinkle with 1 t cinnamon and mix around in the apple juice. Let the apples cook down for 10-15 minutes, stirring occasionally. Sample throughout until they get as cooked down as you want. Depending on how many you're serving, put a serving of Instant Oats in microwave bowls (1/2 c dry oats= 1 serving usually). In each of those bowls, add in a serving of apple juice (usually 1 c). Once the apples having cooked down, split them between the bowls. Microwave on high for 2 minutes. Once out of the microwave, add 1 t cinnamon to each and other fixings. Serve. You can obviously follow the directions on the box and cook over the stove top. I'm usually cooking for one so I cook a whole apple and then save half of it in the fridge until the next day.